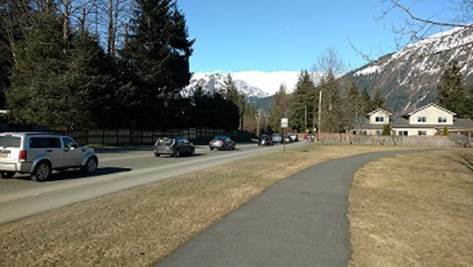 In summer 2018, the Alaska Department of Transportation and Public Facilities (DOT&PF), in cooperation with the City and Borough of Juneau (CBJ), developed and evaluated traffic control concepts that would reduce traffic congestion at the intersection of Stephen Richards and Riverside Drive in Mendenhall Valley. The purpose of the project is to reduce traffic congestion during morning and evening commuting periods at the intersection of Riverside Drive and Stephen Richards Drive. Traffic congestion at the four-way stop intersection creates delays and additional emissions in the Mendenhall Valley air quality maintenance area. Traffic and pedestrian signaling controls. New signs, striping, and lighting. Relocation of utilities and utility poles. Adjustments to pedestrian facilities to comply with the Americans with Disabilities Act. DOT&PF contracted consultants Kinney Engineering to analyze the Riverside Drive / Stephen Richards Memorial Drive intersection and to develop traffic control alternatives to reduce congestion in the area. A preliminary review of the intersection's performance was presented to DOT&PF in an Existing Conditions Report. Click HERE to view a PDF document of the full report. The current all-way stop control was installed in 2008, and since that time lower crash rates have been observed. The intersection currently experiences long queues and excessive delay during the morning and evening peak hours. The traffic pattern is very directional. In the morning peak hour, the predominant movement is southbound through traffic towards downtown, and in the evening peak hour it is northbound through traffic returning to the Mendenhall Valley. About half of the traffic moving the intersection during peak hours is in one direction, with the morning peak traffic heading southbound and the evening peak traffic heading northbound. In the morning peak hour, delay currently averages 89.4 seconds per vehicle, or about 29 hours of delay every day. This is expected to increase to 112.2 seconds per vehicle or 39 hours of delay every day by 2040 if the existing four way stop is left in place. In the evening peak hour, delay currently averages 88.7 seconds per vehicle, or about 33 hours of delay every day. This is expected to increase to 151.1 seconds per vehicle or 64 hours of delay every day by 2040 if the existing four way stop is left in place.